Last week I learned how to jam. My county’s extension office held a class on how to make jams, jellies, and preserves. The class gave me confidence that I could make my own jam at home and I didn’t even need a pressure cooker. All of these can be made with a technique called water-bath canning. For this type of canning, all you need is a few canning supplies and a large stock pot. During the class, I remembered having some peach jam one time and how awesome it was. I scoured some recipes and decided on making Bourbon Peach Jam for my first attempt. The process was actually pretty easy and it turned out great! I hope you have the confidence to do this at home too! The recipes I found made large amounts of jam. I asked the extension agent if we could halve recipes and she said not to. But…I was determined that I would only make a small amount so I wouldn’t have to buy pounds of peaches or end up with tons of a failed experiment. So what is jam, jelly, and preserves? Jam is a fruit spread with some mashed fruit in it. I like jam the best! Preserves has whole pieces of fruit. Jelly is only the liquid from the fruit. You can make jelly from fruit juice already bought. It is a little tougher to get to set. Pectin is what makes jam jam. This is a natural part of a fruit that makes jam congeal, sort of like gelatin, but pectin is vegetarian. It usually comes from apples or citrus. You can buy liquid or powered pectin in several different brands. You can also not buy it and cook your jam longer to make the pectin come out naturally. But this can make your jam have a cooked taste. The extension agent said the best recipes were to follow that which comes with that brand of pectin’s instructions because these have been tested for that type of pectin. 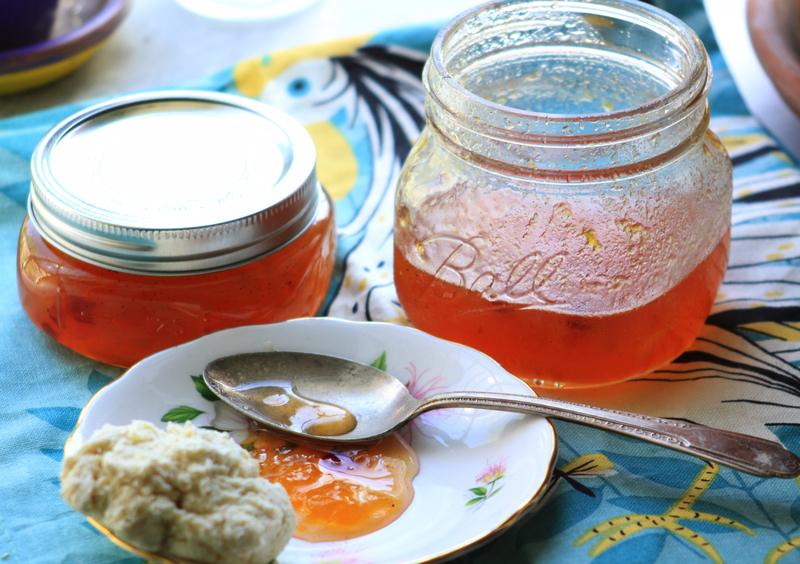 Instant pectin doesn’t need a water-canning. You simply mix it in with your puree and put it in the freezer. You must have freezable jars, such as the crystal ones. Lots of sugar makes jam good, but you can use sugar alternatives. Just follow a recipe because you will need different amounts of sugars. Some fruits need lemon juice like blueberries and peaches. It’s a good idea to add it anyway to help with preserving and to keep the color of your fruit. There are quite a few details when using water-bath and you want to make sure you’re doing it correctly for food safety. It’s a good idea to consult a book to understand the process, such as Jam On. The basic process of water-canning is to sterilize your canning jar, prepare your fruit with lemon, sugar, pectin, and then process your jam in the water-bath. Of course you will need pectin and jars. I highly recommend the magnetic lid wand to help get the lids out of the hot water after sterilizing. A funnel will help keep the mixture off the rim of your canning jar to create a seal. The spring loaded jar lifter is pretty awesome too and I really recommend this. This will prevent your hands from burning, and the spring makes it very easy to use. Sterilize your jars. Add them to a large stock pot to nearly boiling. Keep them here until read to fill. This will also be for your water-bath. Bring a smaller pot of water to a medium temperature, but do not boil. Add the lid (flat lid of canning jar) to the water to sterilize. These lids must be new for the glue on the edge is what helps seal it. They can only be used once. Screw bands can be used again as long as they’re in good condition and don’t need to be sterilized. Peel your peaches if desired. I left some of the skin on. Mash them a bit with a potato masher. Do not blend or food process. Add peaches to a separate stock pot, along with all other ingredients and bring to a rolling boil. (Liquid pectin must be added after cooking, see instructions on package). Then turn off heat. Add the jars to the colander looking thing or rack that’s going to sit inside your pot. This prevents the jars from moving around possibly breaking the jar, or causing your fruit to burn on the bottom. Add lid, and process for 10 minutes at the rolling boil. Turn off heat. Allow to sit in water for 2 minutes without water bath canner lid on. Remove jars and set on a cloth towel on the counter. You will know they are sealed when you hear them ‘pop!’. Allow to sit at least 6 hours, but sometimes it can take 24 hours, or even 2 weeks for it to set right. You will know the jar is sealed when you press on the lid and there is no give. That means a suction has been created. If you are unable to fill a jar totally, you cannot process it in the water-bath. Instead, you get to put it in the fridge and enjoy it immediately! You can store your jam for up to 1 year. Once it is opened, use within 6 weeks. Adding labels (the dissolving ones are easy to remove after using jar) helps you remember!